As we get older, some of us may see “floaters” in our field of vision. In rare cases when many of these floating specks interfere with vision while driving or reading, one treatment option is vitrectomy—surgical removal of the eye’s vitreous gel. The vitreous is a normally clear gel that occupies the rear cavity of the eye. With aging, the gel may develop opacities (unclear areas) and movement, creating the sensation of bugs or dirt in the vision due to shadows cast onto the retina. Patients can see these “floaters” especially against a bright background like a blue sky or a white wall. Many people have an occasional floater, and once this has been evaluated to rule out a retinal tear, this symptom can be safely ignored. Many patients with floaters find that, over several months, the symptoms decrease and the sensation becomes more tolerable. However, some develop extensive floaters that do not subside. The vitreous gel is attached to the retina at birth. At some point, as a natural part of aging, the vitreous pulls free from the retina. This posterior vitreous detachment is the most common cause of floaters. Blood, inflammatory cells, or pigment cells may also collect in the vitreous cavity (see risk factors) and lead to floaters. Vitreous opacities—the cause of symptomatic floaters— are detected by clinical examination with pupil dilation. This is the most valuable and reliable way to observe floaters that a patient is seeing. 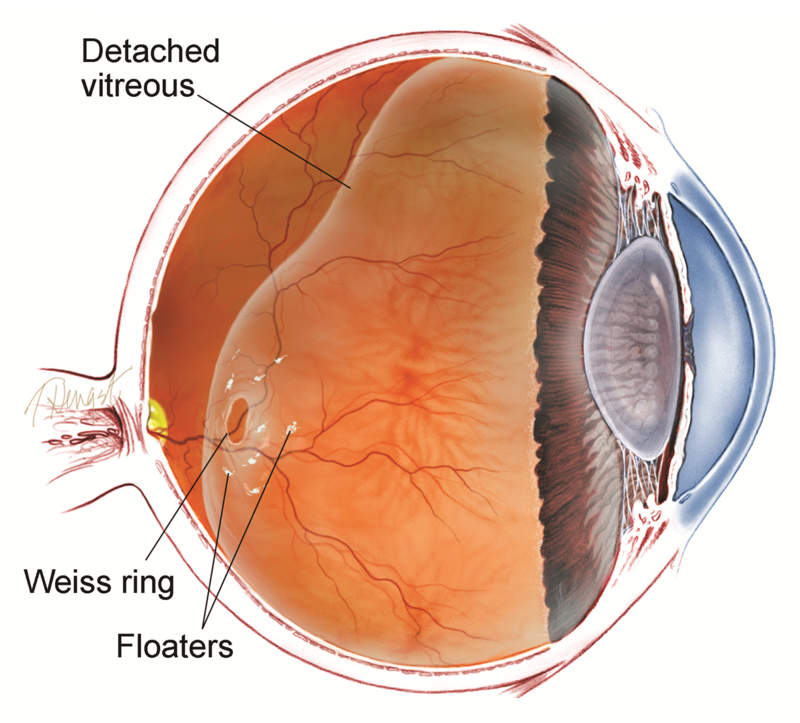 Other ways to evaluate floaters include optical coherence tomography (OCT), B-scan ultrasound, and retinal photography. A decision to treat is based on patient complaints, symptoms, and exam findings. If a patient complains of floaters, but these cannot be confirmed on clinical exam, the need for surgery would be brought into question. On the other hand, some patients have severe vitreous opacities visible on exam, but have no symptoms. Both of these groups of patients are generally observed without intervention. Many patients with mild floaters who are bothered can be persuaded to learn to ignore the finding. Reassurance from a physician that the floaters have been evaluated and raise no threat to vision can be very helpful. However, some patients have vitreous opacities serious enough to consider surgical removal. These cases include those with extensive particles or clouds of debris in the vitreous cavity that move in and out of vision. These patients complain of the feeling that they cannot read continuously, or that as they are driving a car, the cloud moves in front of their vision and they nearly have to pull over for fear of having an accident. Outpatient surgery with local anesthesia can be utilized during vitrectomy to remove floaters and vitreous debris. During this procedure, nearly all the vitreous is removed, and with it, almost all of the vitreous opacities. Risks associated with vitrectomy include, but are not limited to, cataract formation, retinal tear and detachment, macular pucker, and macular edema (swelling). There is a small risk of vision loss. A laser is now available that can be used to try to break up large floaters into particles small enough to be ignored. Randomized clinical trials are underway to determine the safety and effectiveness of this procedure. The Internet has many ads from eye care centers offering this treatment; however, this laser has yet to gain wide acceptance. Previous cataract surgery can increase the perception of floaters.